Guest Pastry Chef in the Bakery!!!! Our friend Zac Young (you may recognize him from the first season of Top Chef Just Desserts and of Unique Sweets) stopped by the bakery today to give us a tutorial on how he makes his famous “Disco Blueberries” that adorns his Lemon Meringue dessert. He just started as the Pastry Chef in the David Burke Kitchen in the James Hotel here in Soho. Definitely stop by for some delicious treats from one of our favorite pastry chefs. Thanks for the visit!!! 6. VOILA! Disco covered blueberries make a sparkly finish to any delicious dessert! 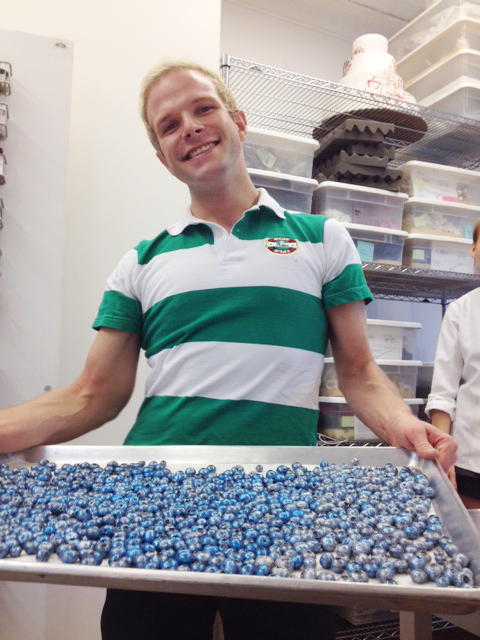 Here is Zac with his sparkly blueberries. Visit him at David Burke Kitchen for some delicious treats. (http://www.davidburkekitchen.com) tell him Rebecca sent you! now those are some damned festive blueberries!